You will need a digital volt meter and a 12 volt circuit tester. Harbor Freight sells their 92020 meter for $3 on sale, list price $9. Make sure your meter has a fresh battery and unbroken leads with sharp points. Decide exactly what isn't working correctly. For example: Left taillight not flashing on the trailer when it is flashing on the truck, or clearance lights flickering on the trailer. 1. If there is no voltage on any terminal (except ground, terminal #1) going back to the trailer, check for blown fuses then check the installation points. Use a wiring diagram to check that the correct wires are tapped into. The wiring harness connectors must be plugged into the correct vehicle connectors and the connectors must be plugged all the way in. It is very rare for a new wiring harness to be defective. If it worked when first installed then went bad, there is probably a short in the trailer wiring. 2. The ground wire on the vehicle harness must be properly connected. To verify the vehicle ground, connect an ohmmeter between the ground wire on the vehicle frame and the ground wire in the vehicle connector. It should read 0 ohms. If it reads anything else select another location on the frame and scratch through the undercoating to get a good ground, if the new location reads 0 ohms, then move the grounding location for the wiring harness. 1. If there is voltage coming out on the appropriate wires at the vehicle end, then there is a problem with the trailer wiring. Inspect the wiring on the trailer to make sure all the connections are correct and ground wires are connected properly. The most common problem is the ground wire on the trailer not being properly secured. A trailer wiring system is grounded to the frame near the coupler. 2. Each light is also grounded. If there is not a white ground wire coming out of a trailer light, then the light is grounded through its mounting studs. Too much paint, dirt, rust or corrosion can cause bad grounds, so insure the ground is secured to the bare metal frame. 3. Check the bulb in any light not working and make sure it isn't burned out. Each bulb must also have good contact inside it's socket, both hot and ground. 4. Check for pinched or cut wires, especially around suspension components or behind taillights. 1. Too many lights on the trailer. Each incandescent taillight draws about 2 amps and each side marker light draws about .5 amps. 2. The trailer connectors can get wet, especially when a boat trailer is backed into the water. If this is a problem, disconnect the trailer connector before backing into the water. 3. Bare wires can touch each other or the trailer frame. The insulation on the wires can chafe, often at the connection to the taillight or when the wires pass over suspension components. If the wires aren't secured snugly up and out of the way, they can get pinched and smashed between the trailer frame and suspension. This creates a short, which will blow fuses and melt wires together. If some of the lights work, but not all of them, you may have a ground problem. If there is a weak ground, when you apply the brakes with the taillights on is when the problem will show up. This scenerio creates the maximum amperage load. 1. The connector on the vehicle should have a ground wire connected to a clean bare metal surface on the frame. 2. The connector on the trailer should have a wire connected to a clean bare surface on the trailer frame. 3. Each taillight assembly at the back of the trailer must have a ground. The most popular way to ground a taillight is with a bolt through the taillight housing and the frame. This won't work if the lights are mounted on wood or plastic. Another way to ground the taillight is to have a separate wire for each tail lamp assembly secured to the frame. 1. The trailer connector must be grounded. 2. There must be a good electrical connection between the towing vehicle and the trailer. 3. Each brake magnet assembly must be properly grounded. 4. The wires attached to the magnets must be connected with a good tight connection to the trailer wiring harness. 5. The wires attached to the magnets must be in good condition with no broken or pinched wires, with no corrosion at the connection point. 6. The magnets must be in good condition, (not excessively worn). 7. 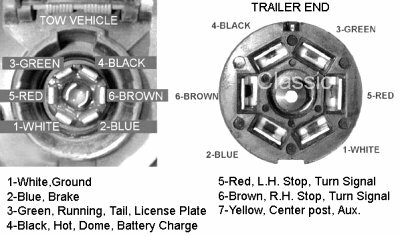 The trailer brake shoes must be in good condition, not cracked, glazed or soaked with grease. Replacing the hub seal each time the hub is removed is cheap insurance. You should be able to hear each brake apply as you walk beside the trailer as it is moving forward slowly and the trailer brakes are applied. You can also test the trailer brakes staticly by raising each tire off the ground and spinning it while someone applies the brakes on the tow vehicle. In most cases, a circuit tester, an ohmmeter and an understanding of how the system works is enough to troubleshoot trailer wiring problems. If there is a problem that is difficult to resolve, RV repair facilities have test equipment specially designed to locate bad grounds, wiring issues and defective magnets.